WordPress Backup and Restore Survey - Here are the results! First of all, we want to say thank you to every BackWPup user for participating in our BackWPup Restore survey! Over 2600 persons participated in our BackWPup Restore survey within this short period of time. That made us jubilant and we see how active the BackWPup community is! Not only your participation but rather your valuable responses, reactions, requests, and critics help us to continue our work and development on BackWPup. We are highly motivated, which makes it better than ever. We received many suggestions via the survey, which don’t belong to the restore functionality itself but to the whole BackWPup project. We will discuss each of them in our team and some of them are already realized. We have taken a detailed look at the results and we want to present you the most interesting ones here. As aforementioned, 2600 people filled out the survey. That is magnificent! We distinguished between english and german speaking user. Both groups showed the same behavior. The BackWPup Restore survey stared with general questions about usage of WordPress and BackWPup. Thus we get a good overview about our users. 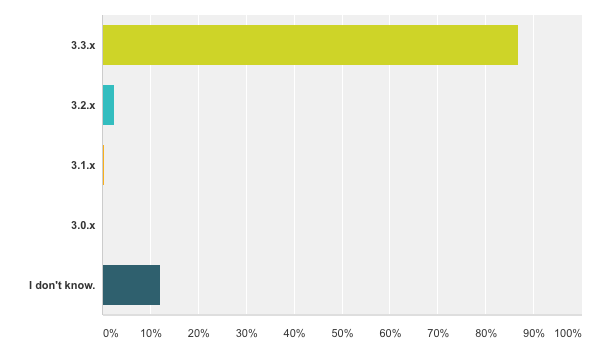 The fact that 92.02 % of all respondents use WordPress 4.5.x is great. We’re happy that the majority is using one of the newest WordPress Versions and keep their systems up-to-date. Only 10.21% are running an older version than 4.5.x. 3.58% did not mention their current version. That the sum is over 100% is no mistake but we used checkboxes and so multiple answers were possible. 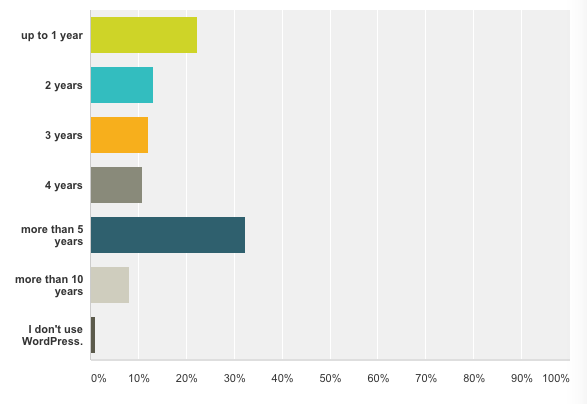 The result confirms our presumption that some users are running / managing different versions of WordPress. Pro-Tip: The current WordPress version you use is easy to find. It is displayed at the bottom right in your backend. BackWPup users are up-to-date. 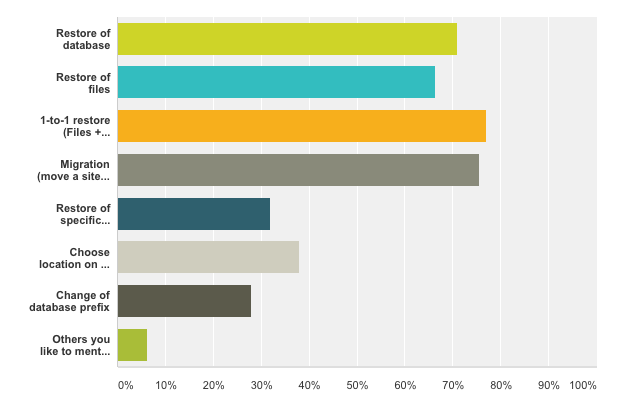 The majority of respondents uses the latest WordPress version. Large spectrum. The largest group of users uses WordPress for more than 5 years, but also beginners are with us. We also asked, how long have you been using WordPress. 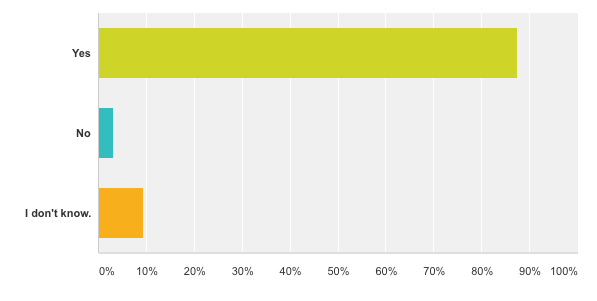 The largest group (32.46%) said, it’s using WordPress for more than 5 years. WordPress beginner / switcher build up the second group with 22.27%. 2 years (13.07%), 3 years (12.16%), and 4 years (10.91%) form a solid middle block. And the longtime users mark the end with 8.08%, which are using WordPress for more than 10 years. 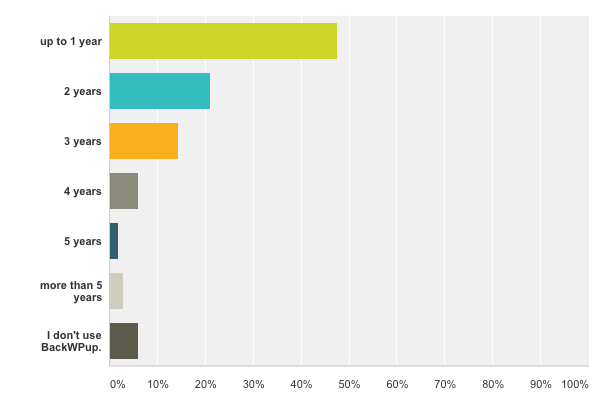 Interestingly, 1% of respondents don’t use WordPress. Of course we’re interested in usage of our WordPress Backup plugin BackWPup as plugin. The results are similar to the ones for WordPress. Most of our users installed the latest version of BackWPup. 86.93% said, they use BackWPup 3.3.x. Only with 2.43% version 3.2.x is following. 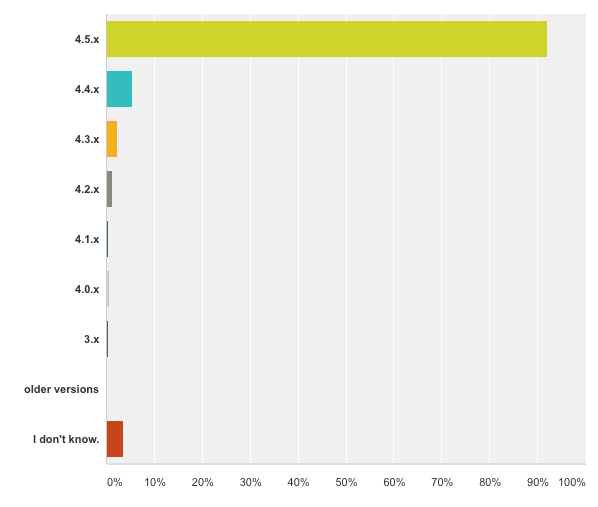 Regarding, how long the users are using BackWPup, 47.54% said they are using it up to 1 year. 21.11% said they use it for more than 2 years. The largest group of BackWPup users are using the plugin up to 1 year. Good to see, that the majority of BackWPup users are using the latest version. Not only is this a good thing for security but also for receiving new features. One thing which didn’t surprised us was the distribution of Free vs. Pro version. 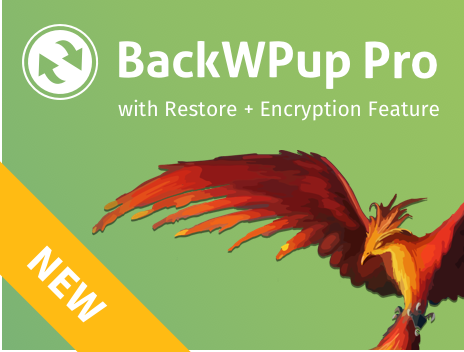 The free version is used by 95.99% and 3.24% say they are using the pro version of BackWPup. A point of criticism, which was mentioned few times by users, is they would like to see an agency license, with which it is possible to manage more than 10 sites. We heard you: From now on we have an BackWPup Pro Agency License for 100 Domains! A clear difference between english and german participants is the choice of provider. Providers chosen by german speaking respondents are: All-Inkl (11.26%), Host Europe (10.74%), Strato (10.04%), and 1&1 (6.51%). English speaking users obviously have chosen different provider. The most popular are: Blue Host (8.45%), Hostgator (7.66%), GoDaddy (5.34%). It is noticeable, that english speaking respondents are more likely to host their sites themselves using services like Digital Ocean, AWS or private server. User satisfaction is our capital. On a satisfaction scale, which starts at 1 (not satisfied) and ends at 5 (highly satisfied), we score 4 in average. That is a pretty good score. Thank you! However we see there are still things to improve. Many feature requests, praise, and also criticism was given. Let’s take a look at the most mentioned ones. Google Drive as Backup Destination: A lot of customers would like to have the possibility using Google Drive as backup destination. Good news everyone, that is already possible. The pro version of BackWPup has the possibility to add Google Drive as destination like any other destinations you are familiar with. Large backups result in Timeouts: A point of criticism is the timeout issue when backing up large amount of data. The connection to Dropbox as destination will timeout and the backup will fail. This issue is known and we are working on a fix and improvement of performance. Though it is difficult to fix the problem because the Dropbox API is hindering us sometimes. Better Usability: Some users were mentioning, that the GUI (graphical user interface) and usability could be simplified. We agree with you. And indeed we are constantly improving the product in several ways. A refactoring of the GUI is on our list, but it turned out to be more complicated than we assumed. Users wish especially for a 1-to-1 restore functionality and a possibility to migrate a site. Much more interesting is the question about wanted features. First place is taken by the 1-to-1 restore functionality (76.94%). Close behind that is the wish for migrating a site (75.58%). Number 3 and 4 are the restore of database (70.95%) and of files (66.48%). It was also possible to add not listed features. Interesting feature requests were made. Whether and when we realize these features is not clear. Some requests were: Search and replace strings within your database, or making the restore multisite ready. The BackWPup Restore survey gave us a lot of good insights and help us for the upcoming development cycles. We are pleased, that so many users participated in this survey and help us with their answers. The restore feature seems to be a wanted feature. We are looking forward to make this feature public. But till it needs more time for testing and eliminating bugs. If you haven’t signed up as beta tester for BackWPup restore but you want to participate, it is still possible. Just fill out this form and put your self onto the list.